If you think Wonder Woman is a badass, then you’ll definitely want to meet Sarah Peacock. 1.2 million miles, 2,800 shows, and fourteen years of nonstop crushing it while flying solo is one heck of a road trip. 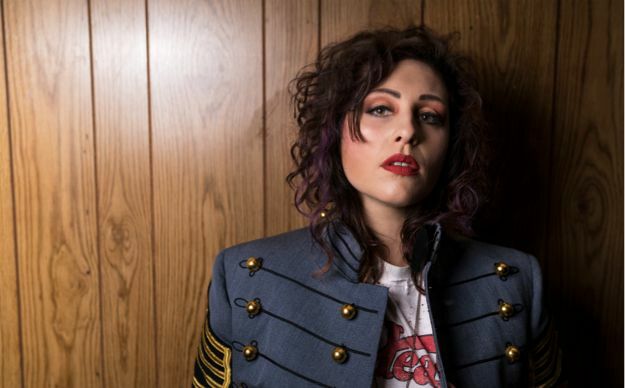 Sarah Peacock bridges gaps between Country, Blues, Americana, and Rock-N-Roll. Her music is raw, truth telling, and fiercely unique. Essentially, at all times, Peacock is victoriously defeating the forces of evil with glorious Amazonian strength and valor. Held hostage by a record label at 21, the troubadour life came with a rude awakening for the young Georgia native. Peacock made her home in a ‘92 Volvo with her dog and a guitar, and for nearly seven years earned a living in the corner shadows of American dive bars. The tables turned in 2011 when an anonymous fan helped her buy out her recording contract. Since then she has released six albums, winning multiple awards for her songwriting. “Hurricane” won Best Song in the American Songwriting Awards, and “Beautiful” was a winner with International Unsigned Only. “The Cool Kids,” and “Are We There Yet” have nominated her for Best Female Artist and Best Song in a number of songwriting competitions. Peacock was also named Listening Room Network’s Artist of the Year. But the dark side takes another swing in 2015. And, big Nashville promises are especially good at grave digging. From RCA Studio A “project golden child” to street orphan practically overnight, Peacock was ghosted by her entire team and producer without explanation. Spirits crushed, she hit the road. Solo. Again. That was the catalyst that launched her next album, “Dream On,” and landed Sarah her first tour bus. But less than 4 months later, she was watching it burn to the ground at a California truck stop. Sarah’s fans quickly came to the rescue with a fundraiser, which is what kept her on the road. That special connection between Sarah and her fans is what put her in Hank Williams Jr.’s former tour bus, one year after the devastating loss. “You have to be unstoppable, even when you don’t believe you are.” That’s the Modus Operandi for the now half Tennessean, half Texan road warrior. When she’s off the road, Peacock is active in the anti-bullying and animal rescue communities. She helped start a rock school for kids and recently formed her own 501(c)3, The Band Waggin,’ benefiting animal health and rescue programs. In 2017, she signed with In Tune Entertainment and American Roots Records. Peacock is sponsored by Taylor Guitars, Fender, 1964 Audio, Strymon, and Mississippi Cold Drip Coffee. Her upcoming EP, “Hot Sheet Motel,” is a collection of 5 songs that reveal the secrets of one woman’s journey through the shadows. The Listening Room Phoenix is centrally located in midtown Phoenix AZ and is open to audiences who appreciate great acoustic music. Some performances are pre-sale ticketed and some are at-door pricing. Your purchase will go a very long way in keeping each artist on their path to success and keeping The Listening Room a healthy destination for great music in Phoenix. Audiences are participating in a live video recording of the performance. Your entrance to The Listening Room Phoenix is consent to be photographed and filmed. The Listening Room Phoenix shares its home with Mazvo Auto Car Care Center on 7th Street south of the traffic light at E. Highland Rd., tucked away from the street at 4614 N 7th Street, Phoenix 85014. Additional parking is available on E. Meadowbrook Road, only steps from The Listening Room Phoenix. IN ADDITION TO THIS AMAZING PERFORMANCE, THE BAND WHITERWARD IS INVITING YOU TO STAY AFTER THE PERFORMANCE FOR A CD LISTEN EVENT OF THEIR NEW RELEASE “HUMAN ALBUM”. THIS IS FREEFOR THOSE ATTENDING SCAROROUGH BUT WILL REQUIRE A TICKET. SEE TICKET LINK FOR OPTION. YOUR ATTENDANCE INCLUDES A COPY OF THEIR NEW CD. Scarborough is the latest effort between indie-folk duo Whitherward’s harmony driven lead singers, Ashley E. Norton and Edward A. Williams. After two hard years on the road and 4 original EP releases, the pair decided to venture off into a project that feeds their souls with songs from one of their biggest inspirations - Simon & Garfunkel. It began by accident - slowly turning most of their set list into songs by the band. The audience response to these covers was so overwhelming that the progression into a complete transformation was natural. Now, their shows will have two personalities. Sometimes you will be able to watch them perform their original music at venues across the country as Whitherward. Other times they will play the roles of Paul Simon & Art Garfunkel as Scarborough. Here we celebrate the biggest folk duo of the century - where poetry and harmony unite. Indie-folk trio with Phoenix, Nashville and St. Luis roots, living on a full-time tour. Singer-songwriters Edward Williams and Ashley Norton threw their belongings into storage three years ago and never looked back. Now with violinist Stephanie Groot, they are just returning from their first UK run. Comparable to a modern-day Simon & Garfunkel or The Civil Wars and full of harmony and intricate songwriting. They're now on their 5th album release along with a plethora of unique music videos. The Listening Room Phoenix is centrally located in midtown Phoenix AZ and is open to audiences who appreciate great acoustic music.Some performances are pre-sale ticketed and some are at-door pricing. Your purchase will go a very long way in keeping each artist on their path to success and keeping The Listening Room a healthy destination for great music in Phoenix. Audiences are participating in a live video recording of the performance. Your entrance to The Listening Room Phoenix is consent to be photographed and filmed. The Listening Room Phoenix shares its home with Mazvo Auto Car Care Center on the west side of 7th Street, south of the traffic light at E. Highland Rd., tucked away from the street at 4614 N 7th Street, Phoenix 85014. Additional parking is available on E. Meadowbrook Road, only steps from The Listening Room Phoenix. ​​IN ADDITION TO THIS AMAZING OPPORTUNITY, THE BAND WHITERWARD IS INVITING YOU TO COME EARLY AND ATTEND A SPECIAL PERFORMANCE OF SCARBOROUGH - A SIMON AND GARFUNKEL TRIBUTE FEATURING WHITHERWARD. THE CD LISTENING EVENT IS FREEFOR THOSE ATTENDING SCAROROUGH AND WILL REQUIRE A SPECIAL TICKET. SEE TICKET LINK FOR OPTION. YOUR ATTENDANCE INCLUDES A COPY OF THEIR NEW CD. ​​A night of all-vegan stand-up comedy featuring Dr. Benjamin Benulis, Meagan Magnuson, and headliner Cam F Awesome and more. Hosted by America’s Vegan Trainer, Will Tucker. Dr. Benjamin Benulisis a plant-based doctor of chiropractic in Central Phoenix who helps people overcome chronic disease conditions. He has been doing amateur stand-up comedy for 10 years and has performed at vegan festivals and venues such as the Woodstock Fruit Festival and the Berkeley Animal Rights center. Cam F Awesomeis a multi-time national champion boxer, keynote speaker, standup comic, and an advocate of the plant-based lifestyle since 2012. Find Cam on social media at @CamFAwesome. Meagan Justine Magnuson is a Punk Rock Vegan, aspiring comedian, self-proclaimed garbanzo efficianado. ​​If the Eagles, Steve Earle, Dave Matthews and James Taylor had a lovechild, they would have named him Darryl Tonemah. Tonemah had no idea that when he began writing songs in college, that several years later, he would have played thousands of shows, made numerous radio and TV appearances, released six albums with multiple awards and nominations, all while building up what has become an international fan base. Despite all of these successes, Tonemah retains a deep connection with his roots and a gift for intimate storytelling that has become his trademark. A full-blooded Native American (Kiowa/Comanche/Tuscarora), growing up on and off reservations throughout the country, as well as his "day job" as Dr. Tonemah, has given him a unique perspective that is evident in his song writing. "I have had the blessing of seeing and experiencing a lot of things during my travels – some great, some heartbreaking, some funny. They all inspire song ideas, lines, chord progressions, and drum patterns scribbled on pieces of paper that I had in my pocket. They usually all manage to end up in the back seat of my car. When I can't fit anything else back there, I figure it's time to record another album." ​​Pierce is an internationally renowned singer/songwriter, a musical poet who has been writing brilliantly crafted, heartfelt musical poetry for many, many years. His performance style is charming, tender hearted, unassuming and intimate. He is an enchanting story-teller, and a master craftsman musically, with a warm, soulful voice and an acoustic guitar style that is a perfect accompaniment to his beautiful songs. His compositions are emotionally intelligent, personal, insightful and often uplifting. Pierce hails from Fort Payne, Alabama, and his roots can often be felt in his music. He was, for many years, a staff writer for Polygram Publishing in Nashville, and his songs have been covered by the likes of Garth Brooks, Dar Williams, Joan Baez and Dion & The Belmonts. He has been a successful recording artist for High Street Records and Compass Records since at least 1989, and has toured internationally sharing his music. He is an American national treasure. Irish singer-songwriter-actor Damian McGinty will be debuting his brand-new full-length album, Young Forever, in early 2019 followed by a tour of the same name. The Young Forever tour is his largest to date and kicks off in Philadelphia, PA on March 19th and will feature vibrant, joyful, pop-infused music that will take you back to a time of living in the moment and yearning for the open road. The 26-year-old Derry, Northern Ireland native is best known for his work with the Irish supergroup Celtic Thunder since the age of 13 and his time acting as Rory Flanagan on the Fox hit television series, Glee. Damian’s first EP of original music, No More Time, was released in the Spring of 2018 and reached #9 on the US iTunes Pop chart while garnering more than 750,000 streams online.